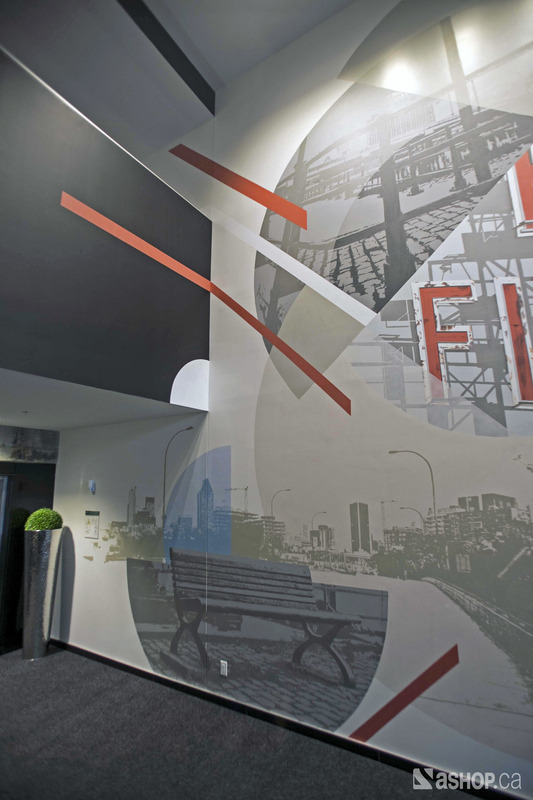 Groupe Cholette contacted us to create a historic mural in the lobby and gym of their District Griffin building. Our interpretation of the theme "View of Griffintown" inspired us to use round shapes like glasses or binoculars that fit the stunning cityscapes of Griffintown. The landscapes, backgrounds and textures used have all been photographed by our artists around the building and some historical images such as trolley. For the wall of the gym, we chose two activities practiced on the Lachine Canal, cycling and running. A more sporty and dynamic design was used in terms of to highlight movement. The aim is to give a sense of belonging to the building tenants and build their relation with their new neighborhood, while strengthening the idea that they have a great view of the scenery as well as access to the channel. The chosen style is modern, clean, sober but retains an artistic cachet in its composition. The work was created by brush to maximize the impact of the linework. The mural was designed by Ankh One with the help of Dodo Ose and Dre.